Earlier in the season I wrote about how Red Bull had used some small Vortex Generators at the transition between the reference plane / plank and the Diffuser. In Shanghai, Lotus also trialled these small appendages in the hope they could glean some additional performance from the Diffuser. Above: A stricken E22 is returned to the pitlane and the crouching engineer assess the diffusers airflow with the assistance of the flo-viz paint. In the inset we can see that the team looked into using Vortex Generators at the Diffusers leading edge (arrowed) at another stage of the weekend. They work by disturbing the airflow in that region which could yield results at certain speed thresholds due to the adverse angle of the diffuser. However I'd also question how they affect car balance and do they simply move the point at which peak performance is available. 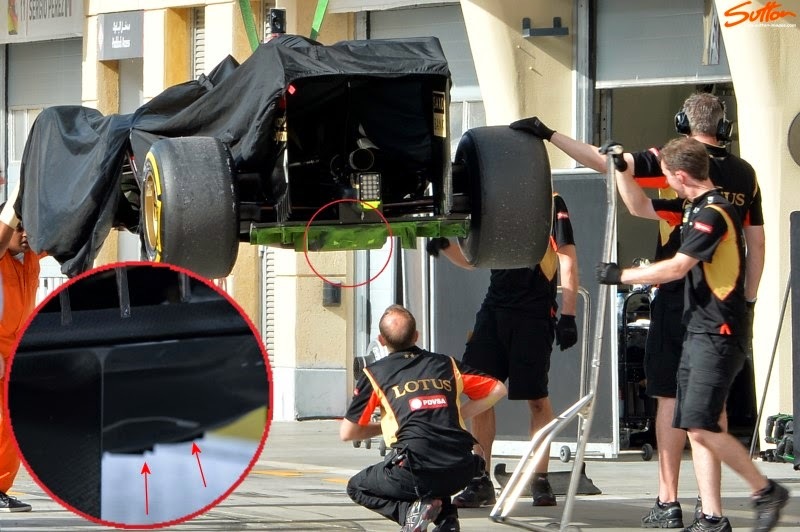 In previous seasons the teams have taken the opportunity to shape the starter motor hole in order to do a similar job (injecting airflow instead) but with the starter hole now needing to be covered both Red Bull and Lotus have tried this solution instead.